I am honored to have two of my photographs used as cover art for recently-released CDs. Both of these opportunities came about through my volunteer work as the still photographer for the serialized-for-TV opera "Vireo: The Spiritual Biography of a Witch’s Accuser." You can read more about my involvement in this project and see the resulting photographs in my blog posts here and here. This photograph is part of a series taken at the “Graffiti Underground,” an abandoned coal pier on the Delaware River in Philadelphia. Other photographs from that location can be found in this gallery. It is always a challenge for me to look beyond the scene in front of my camera to see what else is there. However, when I take the time to go deeper and search for the what else, I have the chance to make photographs that are unique and have greater impact. Abstraction — removing something from its frame of reference — is one way that I attempt to go beyond the obvious. Here are three examples of that approach. Reflections that warp reality are ready-made abstractions. 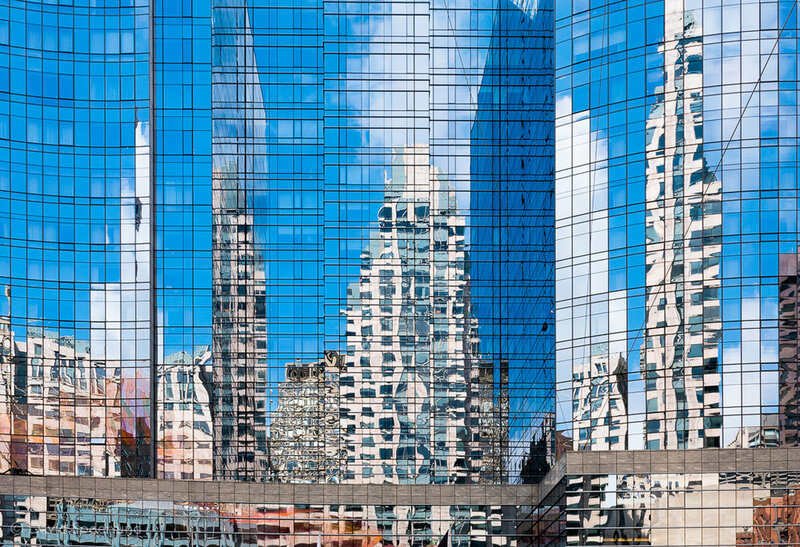 In this photograph, the curved and polished glass walls of Boston’s Intercontinental Hotel turn the reflected skyline into a colorful, abstract cityscape. I have a large print of this photograph in my living room, and I never tire of looking at it. This photograph is an example of a literal abstraction — a small detail excised from a larger scene. Skogafoss is one of the most famous and most-photographed waterfalls in Iceland, so it is difficult to make a photograph of the entire waterfall in its context that is not a cliché. Here, I used a telephoto lens to isolate just part of the face of the waterfall. No longer recognizable as Skogafoss, this image nevertheless portrays the power of the falling water that is for me the essence of the Skogafoss experience. I am fascinated by the different ways that long exposure photography alters our perception of time. We typically think of long exposure as a way to portray the movement of subjects — we put the camera on a tripod, open the shutter for seconds or even minutes, and record the movement of clouds, stars or flowing water. However, holding the shutter open while moving the camera produces different results and leads to new kinds of abstractions. Here, I photographed marsh grass at Paine’s Creek on Cape Cod using a ~1 sec exposure while moving the camera in a horizontal “swipe.” The resulting image is painterly in its lack of sharp detail, yet it evokes for me a sense of the place. I have collected some of my favorite photographic abstractions in this new gallery. I hope you enjoy them! In 2018 I learned that planning and completing a cross-country move did not leave a lot of time for photography. Nevertheless I identified these eight photographs as favorites from my photographic year. The CanAm Photo Expo was held in Niagara Falls, Ontario in April. A friend was fortunate to be assigned a hotel room overlooking the falls, so several of us crammed our tripods in her window one evening to shoot the illuminated falls. I was struck by the otherworldly ice sculptures at the base of the falls. I participated in an informal photo shoot one evening in May at the city pier in Canandaigua, NY. The clouds initially looked promising for a spectacular sunset, but it never materialized. However, the warm light of the setting sun was perfect on this row of boathouses. Just before we left New York I served for the last time as the photographer for the Geneva Music Festival, an annual chamber music festival held in Geneva and surrounding communities in the Finger Lakes. A highlight of the 2018 season for me was “Collaboration: Music and Poetry,” a joint effort of the Cavani Quartet and poet Mwatabu Okantah. Here, Okantah reads his poetry, interwoven with the music of Dvorak’s “American” string quartet. This photograph was taken on a multi-generational family walk (not a dedicated photo shoot!) at Tahoe Meadows, an alpine meadow (~8500' elevation) just on the Lake Tahoe side of the summit on the Mount Rose Highway between Reno and Incline Village. This stand of pine trees, with the sunlit dry grasses in the foreground, seemed to be a perfect subject for creating an abstract image using intentional movement of the camera during a long exposure. This image was selected as an Editor’s Choice by the editorial staff at Nikonians.org. Our brief camping trip to the eastern Sierras in October yielded the remaining four favorite images for 2018. This abandoned cabin, along the side of US 395 near Lee Vining, spoke to me of risks and hardships encountered by those who settled the high desert east of the mountains. This image was also selected as an Editor’s Choice by the editorial staff at Nikonians.org. The mule deer hanging around the campground and resort at Convict Lake didn't pay much attention to humans. We encountered this young guy and his female companion (sibling? girlfriend?) munching the foliage along Convict Creek just across from the campground. Fall color in the eastern Sierra is all about the aspens -- quite different from what we were familiar with in the Finger Lakes. We hiked partway up McGee Canyon and were treated to this glorious display of color. Mt. Laurel dominates the view to the west across Convict Lake from the campground. Here, the intricate details and colors of the face are highlighted by the low morning light coming through the broken cloud cover. Of many images taken over three days, this is my favorite — a quick shot grabbed while hitching up the trailer. Always have your camera ready! 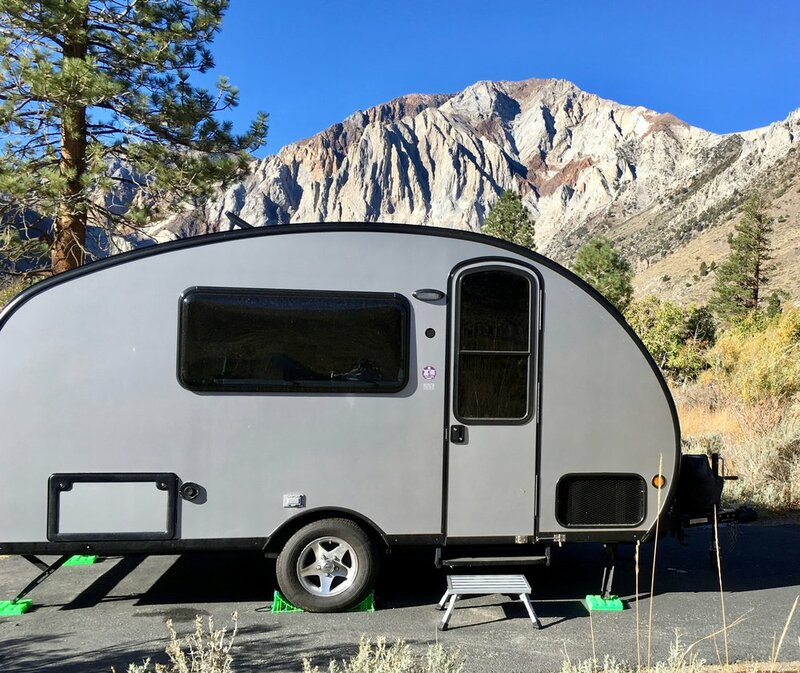 Finally last month we had the chance to begin exploring our new surroundings, camping for four nights at Convict Lake, a few hours south of Reno on the east side of the Sierra Nevada mountains. From there we explored several of the canyons that lead up toward the towering peaks of the Sierra range. The Brave Little Toaster, our home base at Convict Lake. There were two real highlights of this trip for me. The first was the ready access to high alpine scenery. The hike through Little Lakes Valley along Rock Creek, beginning at an elevation of 10,250 feet (! ), led to pristine alpine meadows and lakes framed by mountain peaks. I want to return next summer when the wildflowers are in bloom! The second highlight for me was the fall color display of the aspen trees that grow along creeks and other natural drainages We had hoped that our trip would coincide with the fall color, and we were not disappointed. The images at the top of this post and below give a sense of the color show in McGee Creek Canyon. 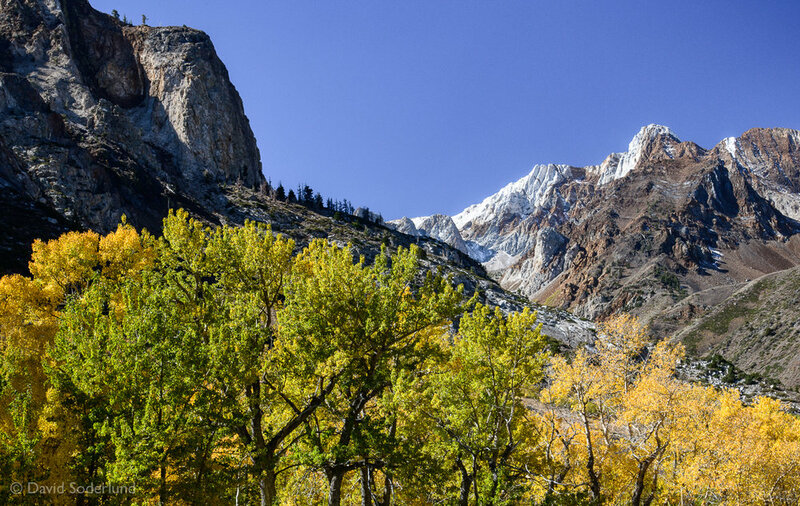 We grew up in Northern California and have spent considerable time on the western slope of the Sierras, but the eastern side is completely new to us. This trip barely scratched the surface, and we will be going back. 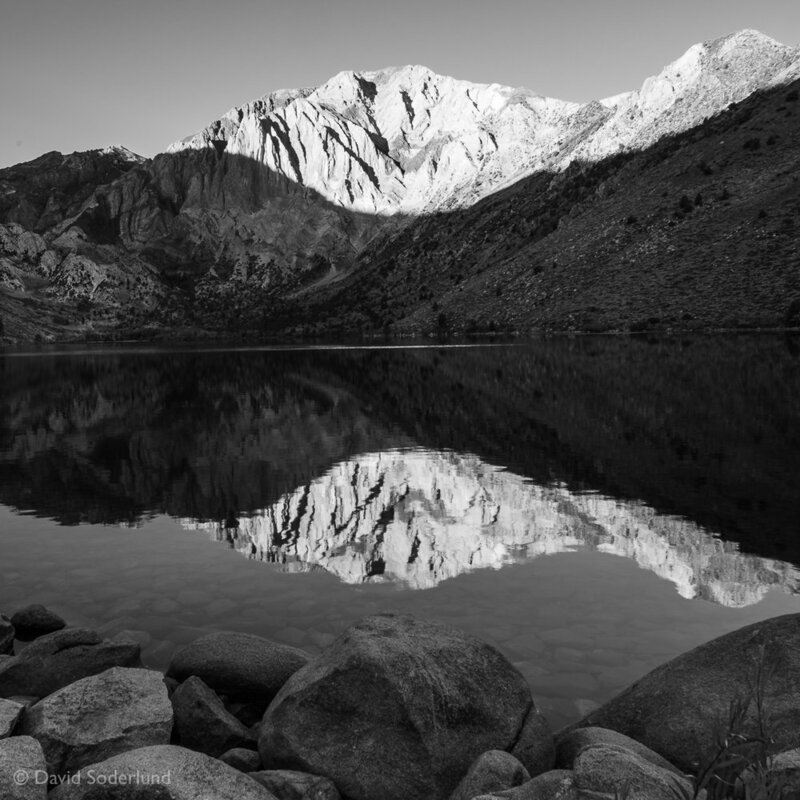 You can find a new gallery with more eastern Sierra photos here. Here is a somewhat belated personal reflection on my photography in 2017 viewed through 12 photographs. As in previous years, these are simply some favorite images from the year presented in chronological order. The abandoned 16th Street Station in Oakland, CA became a surreal circus venue. 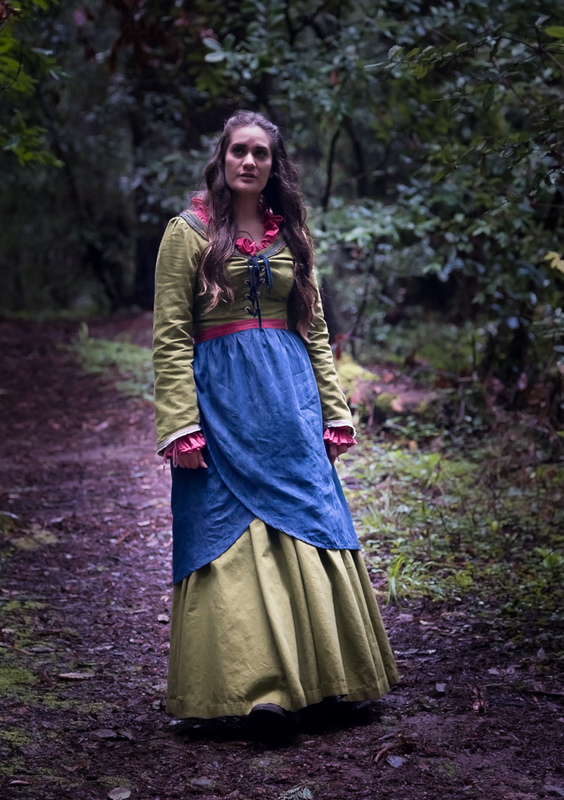 In January I once again had the opportunity to serve as the still photographer for the filming of episodes of the serialized opera Vireo: The Spiritual Biography of a Witch's Accuser. (My blog post about this adventure tells the full story.) Most of the action was filmed in the abandoned 16th Street Station in Oakland, CA, which was converted into surreal circus venue for the climactic eleventh episode of the opera. This image captures both the station itself and the large assembly actors, singers, orchestra, and participating audience that filled the room. 2. Vireo: Deborah Voigt, the "Queen of Sweden"
The "Queen of Sweden" (Deborah Voigt) among the snowflakes (San Francisco Girls Chorus). Near the end of Episode 11 the Queen of Sweden (Metropolitan Opera star Deborah Voigt) makes a dramatic entrance. This photo catches her interaction with young members of the San Francisco Girls Chorus as she moves to center stage. Caroline (Emma MacKenzie) and Vireo (Rowen Sabala) in the red Valiant. Much of Episode 10 takes place during an escape through the snow to Sweden in a red 1962 Plymouth Valiant sedan. For the shoot the car was located inside a white-wall studio, and of course the video crew had all the best camera angles and sight lines. I was struggling to get decent images while shooting through the car windows until I remembered my circular polarizing filter, which allowed me to get unique shots with minimal glare. This image has been widely used in publicity for and articles about the opera. We spent the month of February on a magical trip across the South and North Islands of New Zealand. Carol and I traveled with our son Dru, daughter-in-law Shannon, and our close friend Karen. Karen has visited New Zealand many times over the past 20+ years; she and served as our tour guide, introducing us to "real Kiwis" and places that many tourists do not see. It was much more of a family trip than a photography trip, but it still yielded a wealth of photographic opportunities. This photograph is from one of my favorite locations, Aoraki/Mt. Cook National Park on the South Island. We had this view of Mt. Sefton (just around the corner from Mt. Cook) from our apartment window. I have a number of photographs taken here, including some colorful sunsets, but this image captures for me the beauty and grandeur of that landscape. Plus, the clouds were amazing! The view from Te Mata Peak. We encountered adverse weather only once, while visiting in Napier after our arrival on the North Island. Nevertheless we made the steep drive up Te Mata Peak and were rewarded with this view, made more dramatic by the breaking storm clouds and the touches of sunlight on the sculpted hills. In many ways, this landscape reminded me of my native northern California. Much of New Zealand is one big volcano. Wai-O-Tapu, an extensive geothermal area with geysers, colorful thermal pools, and mud pots, reminded me of Yellowstone National Park. 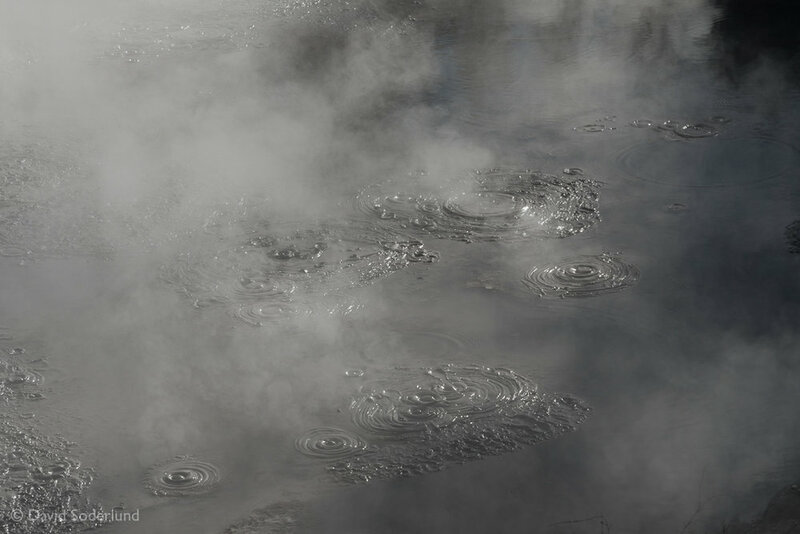 I was mesmerized by this bubbling and burping mud pool -- in the end I decided that it made the most sense as an ethereal black and white image. Sunrise through a pohutukawa tree at Simpson's Beach, New Zealand. The pohutukawa, or "New Zealand Christmas Tree," is an icon of New Zealand. In February we were mostly too late to see the beautiful red flowers, but the gnarled and weatherbeaten shapes of the trees give them a distinctive majesty. This photograph, one of the last ones I took in New Zealand, captures for me the essence of New Zealand coastal scenery. We spent a week in early May among a group of Nikon shooters photographing in Arches and Canyonlands National Parks and Bears Ears National Monument. Many of my favorites from that trip, including this one, wound up processed as black and white images. For this photograph the black and white approach enhances the austerity and majesty of the landscape and highlights the wonderful cloud formation. Double Arch, Arches National Park, UT. This is another black and white favorite from the Utah trip. I had to wait a long time for the horde of selfie-takers to vacate the base of arch! I was initally not very happy with the color version of this image, taken in very harsh light with a featureless blue sky. However I recently gave it another chance in black and white. The result is completely different and much more satisfying, to the point that it climbed right up into the "Best of 2017" list. Sunrise at Letchworth State Park, NY. One of my goals for 2017 was to get out more often to shoot local subjects. This photograph is the result of one such effort, a short camping trip in September at Letchworth State Park, the "Grand Canyon of the Genesee River" south of Rochester, NY. I photographed the sunrise at this location on two consecutive mornings. The first morning proved to be more of a scouting trip, allowing me to find the desired location in relation to the rising sun. In this image, taken the second morning, everything came together with the rising sun above the river of low fog in the valley. We spent a bit more than a week in late September visiting friends who had rented an apartment in Paris for two months. For part of that time we traveled with them to Provence, touring the back roads by rental car. This photograph of the cloister at the Abbaye de Senanque is my clear favorite from the entire trip. I envisioned the final black and white image as I pressed the shutter button. Autumn reflection, Taughannock Falls State Park, NY. The final image in this annual retrospective is from one of my favorite local spots, Taughannock Falls State Park near Ithaca, NY. On this late fall day I was hoping to find reflections of sun-lit fall foliage in the quiet, shady water of the creek. It was not a great year for fall color in our region, so there was not much to work with. However, when I saw the juxtaposition of these rocks and the reflected color I knew I had found my subject. Thirty seconds after I took this photograph the wind came up and the reflection disappeared. "Color is about color. Black and white is about everything else." This quote is attributed to Ansel Adams, but I have yet to find the actual source. Whether or not Adams actually said (or wrote) it, it rings true to me. The origins of fine art photography are monochrome (think Ansel Adams, Edward Weston, and many others) simply because black and white film was the available medium. Today's world of photography is awash in color -- "ultimate" sunsets and sunrises at iconic and not-so-iconic locations, autumn foliage, brightly-colored birds, brilliant flowers. Our visual system is tuned to the world around us, and the color information in images helps us decode what we see and map the image onto our experience. But what happens when color is absent? A 2013 study of the neurobiology of color perception used brain scans to assess how experimental subjects responded to monochrome images of familiar colored objects. In a surprising result, brain regions that activate in response to viewing a specific color (e.g., yellow) also activated when viewing a monochrome image of a familiar object of the same color (e.g., a banana). Thus, viewing monochrome images engages the color sense of the viewer as she seeks to decode the image and fill in the "missing" information. Removing color from an image is therefore a powerful tool to engage the viewer. Here are a few examples in which conversion to monochrome has helped me look beyond color to produce images that are in my view stronger and more compelling. The image at the top of this post is a perfect example of too much color. This rose was exuberantly red, to the point that all I could see in the original image was a blast of color. Of course, the subtle tonal shadings and textures of the petals were also present, but they were subservient to the color. This monochrome version takes the tonal shadings and textures and makes them the subject of the image. For me, the monochrome image invites exploration at a completely different level than the original color version. We were on a photography tour in Iceland at midsummer in 2014 during what the locals claimed was perhaps the worst midsummer weather ever. I wound up photographing beautiful locations in truly miserable conditions. At the Hraunfossar waterfall complex the rain and low monotonous gray clouds created a very limited color palette. With these conditions to work with, I chose to process a photograph from this location in black and white, emphasizing the shapes of the rocks and the flowing water and evoking the starkness of the volcanic landscape. Facebook, Flickr and Instagram bombard us with photographs of beautiful and well-known locations. As a result, opportunities to engage viewers with a fresh perspective on these subjects are limited. One solution to this problem -- which is employed by many dedicated nature and landscape photographers -- is to simply avoid these iconic locations and find compelling subjects in more obscure places. However, it is also possible to use monochrome processing make something other than "just another photograph" of a well-known location. One example, again from Iceland, is Kirkjufell, the "Witch's Hat". This distinctive mountain, with its adjacent triple waterfall, has become a magnet for photographers who visit Iceland. The web is filled with images of Kirkjufell in all sorts of spectacular light -- sunrises, sunsets, dramatic cloudscapes, brilliant auroras. However we were there in the fall of 2016 in so-so mid-day light, making it challenging to take a photograph that was anything more than a simple visual record of my visit..
My decision to process an image from that day in black and white took this iconic spot into more unconventional territory and allowed me to give it a moody feel that was not achievable in the original color image. I like to use monochrome processing for photographs of architectural subjects. Monochrome emphasizes the strong lines and forms of buildings and lends itself to high contrast renderings that would seem garish in color. This image of the rotunda of the Guggenheim Museum in New York illustrates this approach. I have collected some of my favorite monochrome images in this new gallery. I hope you enjoy them! Oakland's abandoned 16th Street Station, the venue for the climactic 11th episode of Vireo. In January I had a second opportunity to photograph the filming of Vireo: The Spiritual Biography of a Witch's Accuser, a serialized opera produced for television by KCET in Los Angeles. As of today all 12 episodes are available for streaming at the KCET website and will be broadcast by KCET in early June. The completion of this project has caused me to reflect back on the whirlwind week in January when I served as the still photographer for the filming of the final episodes of Vireo. It was a week filled with musical superstars (the Kronos Quartet), a Metropolitan Opera star (Deborah Voigt), and a cast of, well, hundreds anyway, including members of the San Francisco Girls Chorus and Chorus School, musicians from the Magik*Magik Orchestra, members of the vocal ensemble Lorelei, and an audience/orchestra of musicians from the Amateur Music Network. Locations included the Ft. Mason Center and a video studio in San Francisco, Samuel P. Taylor State Park in Marin County, and -- most notably -- the abandoned 16th Street railroad station in Oakland (lead image), transformed for this event into a colorful and surreal circus venue. The week began at the end of the opera with the filming of the 12th and final episode, featuring Rowen Sabala (Vireo) and the Kronos Quartet. Originally the entire episode was envisioned to occur in a redwood grove, but the fickle and wet January weather precluded any outdoor performance by the Kronos Quartet. Instead, filming took place at the Fort Mason Center in a large empty room lit by windows on three sides. Final instructions from Composer Lisa Bielawa and Director Charles Otte for Rowen Sabala and the Kronos Quartet. Musical interplay between Rowen Sabala and David Harrington, founder of the Kronos Quartet. Later in the week, this episode was re-shot on location among the redwoods in Marin County, with Rowen performing her aria a cappella. I will be interested to see how the production team integrates these two performances in the final version of Episode 12! In the middle of the week action shifted the 16th Street Station for the final segment of Episode 10 and all of Episode 11. At the end of Episode 10 Vireo is treated with morphine in a segment featuring members of the Lorelei Ensemble dressed as nurses. Subsequently she is wheeled on a gurney to the center of the "circus ring," where Episode 11 begins. Rowen Sabala (Vireo) and Emily Marvosh of the Lorelei Ensemble. Vireo in the circus ring. It is impossible to describe in a few words the chaos and drama of Episode 11, Vireo's drug-induced dream in which familiar characters are transformed in strange and sometimes fantastic ways as the story reaches its climax. The following photographs provide glimpses of the action. 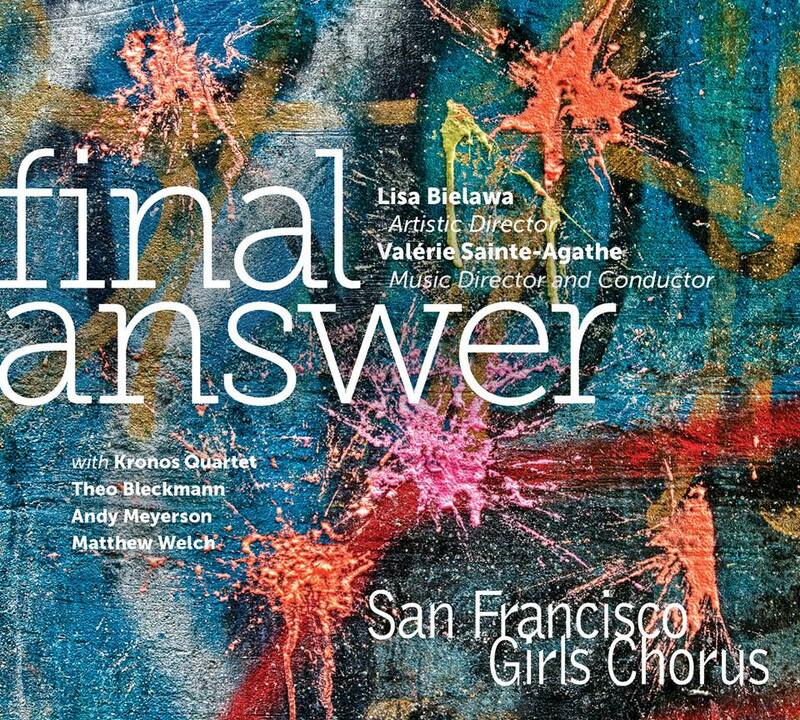 Vireo (Rowen Sabala), awakened from her drug-induced sleep, sings the Dragon Aria to the "afflicted girls" (San Francisco Girls Chorus). The Doctor (Gregory Purnhagen, right) and his Assistant (Ryan Glover) are transformed into clowns on tricycles. Caroline, Vireo's "mysterious twin" (Emma MacKenzie) appears in devilish garb, accompanied by her strange doll/totem. Episode 11 reaches a climax as Caroline (Emma MacKenzie) and Vireo (Rowen Sabala) name each other as witches. The Queen of Sweden (Deborah Voigt) makes a dramatic entrance. The Queen of Sweden (Deborah Voigt) among the Snowflakes (San Francisco Girls Chorus). Amateur musicians in the audience provide musical punctuation for the Queen's pronouncements. The view from the Queen's throne gives a sense of Episode 11's epic scale. Finally, at the end of the week, the action moved a white-walled studio in San Francisco to film scenes from Episode 10 involving the principal members of the cast and a 1962 Plymouth Valiant. Nearly all of the action took place inside the car, a challenge for both the cameraman (who obviously got all the best shots and sight lines) and me. It was nearly impossible to get useful images through the windows of the car until I realized that I could use a circular polarizing filter to minimize reflections! Being even a small part of the Vireo project was both exhilarating and immensely satisfying. It posed a variety of photographic challenges that stretched me beyond my comfort zone and demanded the most of my equipment. However, unlike my first gig as a photographer for Vireo, this time I was known to the cast and the production team and, in turn, I had some idea of what to expect. In the end I was able to deliver a portfolio of images that were selected for both their quality as photographs and their narrative value to document the production. January... time to look back, take stock, and look ahead. Taking this advice from "St. Ansel" to heart, I have selected a set of twelve photographs (out of almost 5000 shutter clicks) from 2016. These are not necessarily the "best" (whatever that means) or most popular on social media. Instead, they represent waypoints that were significant to me on my photographic journey. Here they are, in chronological order. In March I made a return visit to the historic abandoned silk mill in Lonaconing, MD. When I saw this rack of metal thread cones I immediately saw in my mind the image I wanted, and I ran through the rain back to my car for my 85mm f/1.8 lens. This is one of my two or three favorite images of the year. This image from the Lonaconing mill was also made with the 85mm f/1.8 lens. I was drawn to the subtle patina on both oil cans and the sense of depth afforded by the out-of-focus machinery in the background. These two Lonaconing images, plus six others from this visit and and my first visit to the mill in 2013, comprised a portfolio that was selected by a jury for inclusion in the "Portfolio Showcase 2016" exhibit at the Image City Photography Gallery in Rochester, NY in August 2016. More Lonaconing images can be found in this gallery. June found me in San Francisco, serving as the photographer for the production of an episode of "Vireo: The Spiritual Biography of a Witch's Accuser," a serialized opera being produced for television. This episode was filmed on Alcatraz after the park closed for the night. My assignment was to photograph the entire production -- from the boat ride to Alcatraz, to behind-the-scenes shots of performers, musicians, and production crew, to shots of the performances in progress. This image, one of my favorites from that event, was shot through the dirty glass window of the open door of the main cell block. I was able to frame both Greg Purnhagen (in the role of Doctor/Priest) and the steadycam operator recording his performance. I was able to get this image of Emma MacKenzie (Vireo's "mysterious twin Caroline") between takes. The dramatic side lighting of the video lights caught her pensive expression as she awaited her entrance (in a straightjacket, seated on a hospital gurney and holding an odd skeletal totem) at the beginning of the scene. In July I had the rare opportunity to spend a brutally hot day with a group of hard-hatted photographers on a tour of the unrestored Immigrant Hospital on Ellis Island. The hospital was immigration "purgatory" where immigrants with health problems awaited a decision by the medical staff -- only those deemed to be healthy were allowed to immigrate, whereas the sick ones were returned to their port of origin. I found it interesting that the Statue of Liberty was so clearly visible from many of the hospital rooms, an ever-present reminder of a hoped-for future that was not yet attainable. This year's trip was billed as "Aurora Madness" and it definitely delivered. This image, taken during the night of the most intense aurora display, captures for me the essence of being all alone overlooking glaciers and mountains with the aurora dancing overhead. No visit to Iceland is complete without a visit to the Jökulsárlon glacier lagoon and the adjacent black sand beach. Here the "blue hour" light, just before sunrise, accentuated the natural blue color of the icebergs. Iceberg fragments carried out of the lagoon at Jökulsárlon are washed up on the adjacent beach made of black volcanic sand. At sunrise these diamond-like ice fragments sparkle and glow as if lit from within. Here, a long exposure softened the breaking waves to accentuate the sharp detail of the iceberg. Kirkjufellsfoss is one of the most iconic (and over-photographed) locations in Iceland. During our 2014 Iceland trip we were here on a gray, rainy and windy day and I came away with no useful photographs. This year the weather was more benign and I was finally able to get this image. The moody look was achieved by conversion to black-and-white with a red filter to darken the sky and add drama. The sea arch at Arnarstapi is on the southwestern coast of Iceland. This photograph is the result of one of those rare occasions where I achieved exactly what I intended. I found a high camera position to achieve visual separation between the arch and the rocks in the distance, and I used a 3-minute exposure with a strong neutral density filter to soften the movement of the breaking waves and accentuate the movement of the clouds. I knew from the outset that this would ultimately be a monochrome image. The modernization of the Icelandic economy over the past several decades has resulted in the abandonment of many rural farms. This shot was not originally among my collection of most significant photographs, but I kept returning to it in my image review. It speaks strongly to me of the changes that have occurred in rural Iceland. This photograph is the result of another second chance following a disappointing experience on the 2014 trip. Here, the Oxarar River plunges over a cliff and flows down the rift between continental plates in Thingvellir National Park. On the last trip I found this panoramic composition only with my iPhone; this time I was determined to revisit it with my camera. On this day, the fading fall color of the low bushes along the river and the dark clouds added a sense of drama, as if winter were just around the corner. In pulling together this set of images I was surprised to see that they represent only a handful of my photographic adventures. There were many other images from other locations that did not make the final cut. I am also surprised that none of the final twelve images were taken locally. One of my resolutions for 2017 is to get out and about more in the Finger Lakes, camera in hand, to take advantage of the scenes and subjects that are close by. Director Charlie Otte and Director of Photography Greg Cotten record shots of Vireo (Rowen Sabala) approaching Alcatraz. The words opera and Alcatraz seldom occur in the same thought or sentence, let alone the title for a blog post. However, earlier this year I had the chance to serve as the official still photographer for the production of an episode of a serialized made-for-television opera that was staged in the cell block on Alcatraz one evening after all the tourists had gone home. 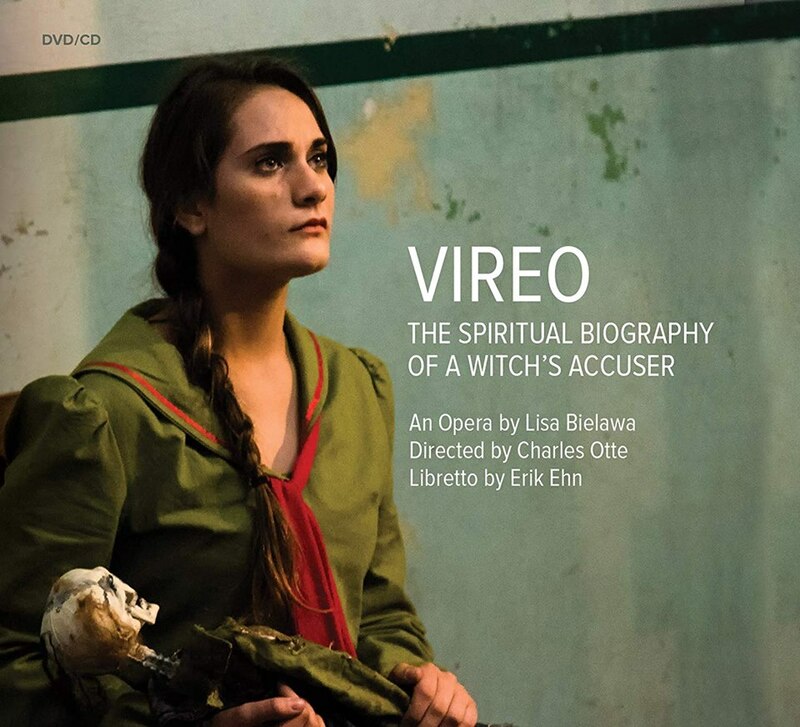 The opera in question is Vireo: The Spiritual Biography of a Witch's Accuser, written by composer Lisa Bielawa with libretto by Erik Ehn. Conceived more than two decades ago as a "conventional" opera, Vireo was never completed or performed in that format. However, the opera was recently re-imagined as a television serial consisting of twelve 10- to 12-minute episodes and is now in production by KCET-LA under the direction of Charles Otte. The full opera will be released by KCET in the spring of 2017, but the first two episodes, plus interviews and other background information, can be seen now on the KCET website. I became involved with this project through a bit of covert nepotism: you see, Lisa Bielawa is my niece, so I have followed the development of the new Vireo project from its inception, albeit at a distance. When I learned that one episode would be shot on Alcatraz at a time when I would be in the Bay Area I hoped that I might tag along to see and photograph the event, but when I learned about the strict limitations on the number of persons to be allowed on Alcatraz after hours by the National Park Service I gave up on that idea. Fortunately for me, the Vireo team was having difficulty identifying a photographer to document the Alcatraz episode. Lisa said "I know a photographer who is available and would donate his services" and pointed the Vireo folks here to my website. Apparently what they saw convinced them that I could do the job. As a result, I found myself identified as the "photographer" on the tightly-regulated list of 49 people who boarded the boat to Alcatraz -- actors in costume, wardrobe and make-up assistants, musicians, and the large entourage of people and equipment needed to set up an on-site video production studio in the Alcatraz cell block. They all thought I was just "some photographer Lisa knows." Only she and I thought it was a little strange! The cast and crew of Vireo at the dock on Alcatraz, ready to begin work. My assignment was to photograph the entire production -- from the boat ride to Alcatraz to behind-the-scenes shots of performers, musicians, and production crew, to shots of the performances in progress. The Vireo production team would use these photographs for their social media campaign and other publications. I had never done anything like this before -- it was both daunting and exhilarating, an experience I will never forget. The first scene was shot in the main cell block with Greg Purnhagen (in the role of Doctor/Priest) accompanied by six vocalists and a hurdy-gurdy. Composer Lisa Bielawa provides last-minute instructions to members of Cappella SF. Randy Matamoros and the hurdy-gurdy. Greg Purnhagen (Doctor/Priest) in action. Vireo (Rowen Sabala, left) and her "mysterious twin Caroline" (Emma MacKenzie). Emma MacKenzie (Caroline) between takes, awaiting her entrance. One hospital cell was converted to a video production studio. Here, the only lights were the Director's video monitor and the status lights of electronic equipment. I thought that this photograph was impossible under these conditions but I took it anyway. Director Charles Otte giving instructions during a take. A string quartet and a handbell choir provided accompaniment for the hospital cell scenes. 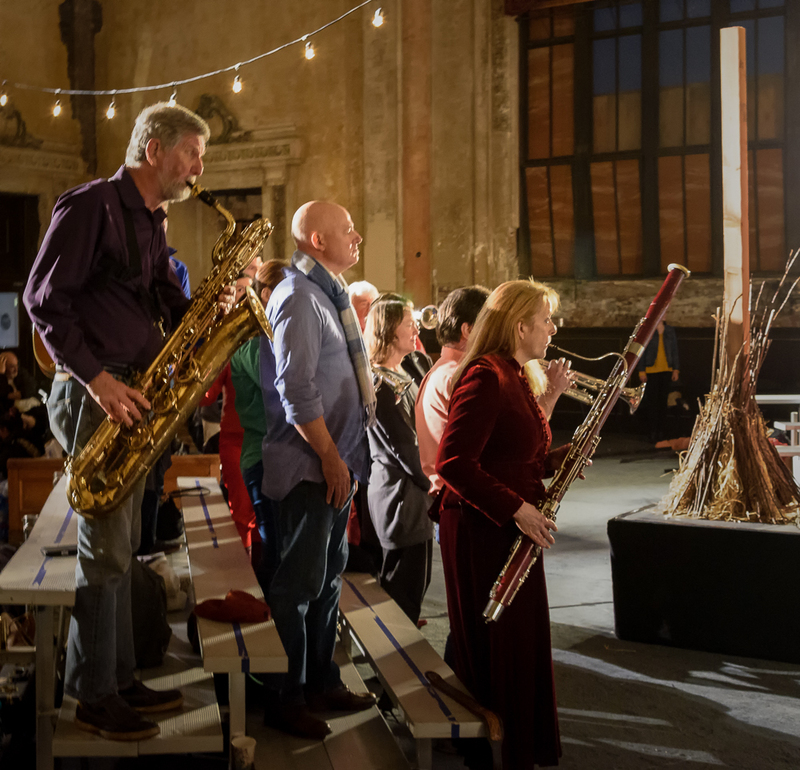 Members of the American Contemporary Music Ensemble in the Alcatraz hospital. Handbells in a hospital cell under the direction of composer Lisa Bielawa. The tight production schedule was complicated by the need to shoot each scene twice -- in 19th century and 21st century dress -- to facilitate cutting between these takes when putting together the final video. Rowen Sabala (Vireo) in 21st century costume awaits an entrance. After six hours of intense work the cast, musicians, and production crew left the Alcatraz dock at midnight, just beating the National Park Service-imposed deadline for our departure. Rowen Sabala and Lisa Bielawa on the boat ride home -- tired, but happy! From a photographic perspective, it was a success -- the Vireo team liked the images that I provided them and used them in several stories about the event (such as this one). Better yet, it looks like I will have the opportunity to photograph the last two episodes of Vireo in January. This time, I will have some idea about what I'm getting into! Last month I had the rare opportunity to join a small group of hard-hatted photographers spending the day shooting in the unrestored Immigrant Hospital on Ellis Island. The hospital opened in 1902, serving as a detention facility for immigrants who were ill and therefore considered unfit to enter the United States. After the hospital was closed in 1930 the buildings served as offices for the FBI, a detention facility for WWII prisoners of war, and finally a Coast Guard station. The Coast Guard declared the buildings to be "excess government property" and they were abandoned in 1954. However, recent fundraising efforts have allowed some of the buildings to be stabilized against further damage and decay, and parts of the hospital were opened to the public for hard hat tours in 2014. Our day-long photographic tour, which involved access to parts of Ellis Island hospital complex that are still not open to the public, was arranged by photographers Tony Sweet and Mark Menditto in cooperation with Save Ellis Island and the National Park Service to raise funds for additional restoration work. Here are some of the first batch of images from that day. The hospital employed advanced methods in public health medicine, such as giant autoclaves used to sterilize mattresses. For more than 3500 immigrants the journey to a new life ended on Ellis Island. The hospital's autopsy theater was a teaching facility that drew medical students and observers from hospitals across the United States. A few weeks ago I had a chance to return to Lonaconing MD to photograph the abandoned silk mill there. The three years since my last visit have not been kind to the place. There are more leaks, more decay -- it is clearly several steps closer to ruin. Who knows if it will remain standing (and safe to enter) long enough for me to shoot there again? This time I paid less attention to the bigger picture and focused on little things. For me, these details to evoke a sense of the past occupants and their work as much as -- perhaps more than -- the rows of silent machines. Several of the images here were taken using my (relatively) new Nikkor 85mm f/1.8 lens. Previously I had used this lens almost exclusively for candid people pics (grandkid shots). At Lonaconing, I enjoyed how this lens allowed me to play with shallow depth of field as a way to direct the viewer's eye and to isolate a subject. The more I shoot with this lens the more I like it! My existing Lonaconing gallery has been updated with these new images. Selections from that gallery will become part of an eight-image Lonaconing portfolio that I am assembling as an entry into a juried portfolio exhibition at Image City Photography Gallery in Rochester, NY. I have no idea whether a Lonaconing portfolio (I have four candidates at the moment) will be strong enough to be accepted. However, the process of selecting only eight images (specified by exhibition rules) that can both stand on their own as photographs and tell a story when viewed together has stretched my brain in new directions. We'll see how this turns out. Spindle detail. Nikon D750, Nikkor 24-120mm f/4 @ 70 mm, ISO 100, f/4. The abandoned silk mill in Lonaconing, MD is an eerie place. The Klotz Silk Throwing Mill was built in 1905 to spin and dye silk thread, taking advantage of a local source of cheap labor -- the wives and children of coal miners in the nearby mines in western Maryland. In 1957 the Klotz company closed the doors in a labor dispute, and the mill has been abandoned since, left to the elements. The current owner permits groups of photographers to visit the building, for a fee, to step back into the world of 1957. We were fortunate to have the chance to photograph the mill in the spring of 2013, and I will be returning soon to photograph it again and see what has changed during the intervening three years. In preparation for that visit, I have collected images from my 2013 visit in a new gallery. There are more pictures from our 2013 visit on Carol's blog here and here, as well as a cool video that gives a sense of being there on a rainy day. My turn (a little late) for the photographer's conventional look back at 2015. These ten images are not necessarily my "best" (whatever that means) or "most popular," just the ten that resonate the most with me. This image was taken on a cold January night during an indoor macro shoot. I was experimenting with off-camera flash to illuminate the rose from different angles. I particularly liked this shot, but it was just too red! 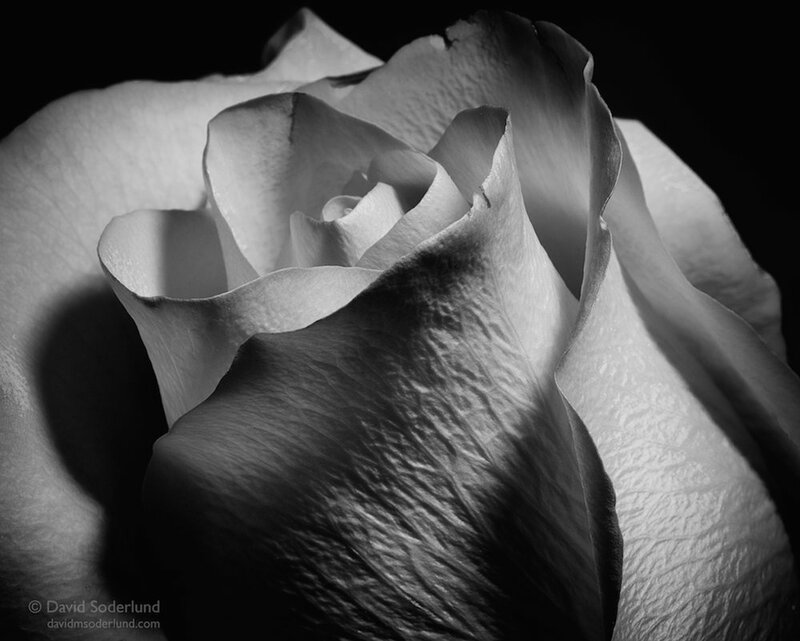 Conversion to B&W shifts attention to light, shadows and texture rather than in-your-face color. Torrential spring rains created heavy flow in all of the waterfalls in the Finger Lakes. This was my first visit to Eagle Cliff Falls in Havana Glen (not far from the much more famous Watkins Glen). Despite the rain and the sediment in the water I came away with this rare shot of the falls in full roar. This was taken at Seneca Yacht Club on a warm summer evening. I was experimenting with using a new reverse graduated ND filter to balance exposures in shots where the sun is just above the horizon. I think it worked! I was on the Boston Greenway in August shooting a large outdoor fiber art installation, but my eye was grabbed by the abstract reflection of the Boston skyline in the glass wall of the Intercontinental Hotel. This is another shot from Boston. We encountered this street drummer while walking through Quincy Market. I was happy just to listen until a little boy approached and wanted to join in the fun. The drummer gave him one of his sticks and then matched his beat to what the boy was doing. I scrambled to dig my camera out of my bag, but by the time I was ready to shoot the boy was done, except for the congratulatory "fist bump" from the drummer. Again, I chose a grainy B&W treatment to remove the distractions of color and focus attention on the drummer's face. This image and the next two were taken during a workshop on Cape Cod led by Tony Sweet. Here, a two-minute exposure (using a 10-stop ND filter) at Race Point Beach captures the streaming movement of the clouds against a static foreground. These vacation cottages line the beach along Cape Cod Bay in Truro, MA. When we visited they were quiet, boarded up for the winter. The high contrast of the early afternoon light made this an obvious choice for a B&W treatment. On the way to catch the sunrise from the Fort Hill overlook at Cape Cod National Seashore, I said "Try to remember to try some swipes." This image, the result of a 6-sec horizontal swipe (hand-held), turned the pre-sunrise landscape into an abstract with layers of color. Before dawn at the historic wharf in Coupeville WA -- one of my very favorite images for 2015. This image is my favorite from an October visit to Olympic National Park. I actually photographed this location twice, two days apart. This shot is from the second day, which followed a day of steady rain. Here I was finally able to break away from conventional compositions from this location. I isolated the top of the falls, allowing me to use the lines of the flowing water to lead the eye back to the rich fall colors. This is the irony of photography in the digital age: the number of photographers has exploded and the internet is full of images, but the majority of these images are trapped on computers, tablets and smart phones and are viewed only transiently, often on a small screen. Only a tiny minority of these images ever escape from “pixel prison” and become printed, permanent things. Canadian photographer David duChemin encourages photographers to print their work, hang it on the wall and live with it for a while. Only then, he maintains, can one gain some perspective about the enduring value of any particular photograph. More than a year ago I decided to listen to duChemin and get more serious about printing my photos just for me, rather than the occasional print ordered as a gift for someone. For a while I was seduced by the apparent economy of print-to-order services, but I was ultimately not satisfied with how faithfully the print reflected my on-screen image. About a year ago I bought a dedicated ink-jet photo printer that will print images up to 13” x 19”. Since then I have been on a journey, fueled by ink and paper, that has led me to a greater understanding of the relationship between the digital image and the print and greater satisfaction with my own printed products. Although I am still a raw beginner with lots left to learn, my own prints now are much more satisfying that what I was able to achieve by ordering prints online. The image above is one of my favorites from the past five years of photography. It was taken on a winter afternoon in Brooklyn, looking down Washington St. toward the Manhattan Bridge and intentionally composed to show the Empire State Building framed in the arch of the bridge tower. This photo was first printed for me by a local print-to-order business as part of a set of black-and-white images (some of mine, some of Carol’s) that we intended to display as a group, the “black-and-white wall” of our dining room. After looking at it in this context for a while, I realized that the image needed to be both BIGGER and BETTER. Some additional post processing work solved the “better,” and my new printer took care of the “bigger.” The first image in this post is the result: printed 13x19, matted and framed 18x24. I was finally satisfied. Recently, this image has been “on the road,” first as part of an annual exhibit of photos by members of the Finger Lakes Photography Guild in Canandaigua, NY, and currently as part of a juried show at the Image City Photography Gallery in Rochester, NY, where it was featured among the preview images for the show. The journey from pixels to paper made it possible to share this image in new ways. You'd think an entomologist would have loads of insect pictures, but I have only a handful. I found these four last week while looking for illustrations of macro and close-up photography and decided I liked them well enough to share. Nikon D90 + Sigma 150mm f/2.8 macro; Keuka Lake Outlet trail, NY. Only the first image was taken with a true macro lens, the Sigma 150. On a crop sensor camera like the D90 it makes a great "bug stalker." Unfortunately, when I upgraded to a D7100 I found it was incompatible with the Live View autofocus system of the new camera (important for shooting on a tripod), so I sold it. The remaining three images were "opportunity shots" taken with a variety of all-purpose zoom lenses. In each case, I got as as much as I could at the longest focal length and then I cropped afterward for the best composition. I'm surprised at how well this approach worked even with the 12-megapixel D90; with modern higher resolution digital sensors you can really throw away a lot of pixels and still come away with something. Nikon D90 + Nikon 70-300mm f/4.5-5.6 VR, The High Line, New York City. Nikon D90 + Nikon 16-85mm f/3.5-5.6 VR; Garden of the Gods, CO.
Nikon D90 + Nikon 18-200mm f/3.5-5.6 VR; Anthony Road Winery, Penn Yan, NY. These images make me want to shoot more insect pictures. The first image, in particular also makes me want to get a new "bug stalker" macro lens. First, some background on this particular contest and the image in question. I am a member of Nikonians, a large and diverse international community of professional and amateur photographers who use Nikon equipment. A number of Nikonians web forums hold monthly or quarterly themed competitions. The theme for the May 2014 contest in the Travel Photography forum was “carnival,” selected by the winner of a previous month’s contest. I decided that some of the images from our trip to Venice during Carnevale in 2012 fit this theme and submitted two shots of individuals in elaborate and traditional Carnevale costumes. One of these images (below) was selected as a “finalist for the month” (again, by the winner of a previous monthly contest), then selected as the monthly winner by a poll of those visiting the Travel Photography forum, and finally selected by a jury of eight experienced photographers from among more than 100 monthly/quarterly winners of the themed contests and challenges during 2014 as one of the “ten best of Nikonians 2014” images. What is it about this image that caused it to be selected, through three rounds of judging, from the literally hundreds of images submitted to the various Nikonian forum contests? The composition is simple, the pose is classic (thanks to the model, not to me! ), and the colors are rich. However, I think it is the eyes, engaging almost confrontationally with the camera, that make the picture distinctive. (When I posted the picture to Facebook, a friend commented that it was “unnerving, but in a very cool way.”) Her eyes reach out to make, almost demand, a connection with the viewer. A more difficult question is: how can I make images of my more usual (and inanimate) subjects that also connect powerfully with the viewer? But then, who are the “viewers” of my images? I am not a professional photographer and have no desire to be one. I got back into the photography game five years ago primarily to please myself by taking something more than just snapshots, but I would be lying if I said I did not derive satisfaction when others see and respond to my photos. Still, I have no desire to play the popularity contest game that is 500px these days or accumulate lots of superficial “likes” on Facebook or Flickr. In the end, this is the liberating beauty of being an amateur: I can make the photos I want to make, share them where and when I want to share them, be thankful if some people find value in them. Being a “winner” in a photo contest is important to me because it demonstrates I’m not just talking to myself through my photography. That’s enough for now. Here is is the first day of 2015 and I am still catching up on last year's website chores. After a break of a few months, I have now finished working through my Iceland "keepers." Here are the last five images, which also appear in my updated Iceland 2014 gallery. Abandoned hillside hut near Stokksnes. This peat-roofed wooden church, partially dug into the soil, was reconstructed in 1884 on the foundations of a 14th century building. It is still in use. This more intimate iceberg lagoon lies below the foot of the Fjallsjokull glacier. It took me a while to find a way to process this image that yielded the subtle colors and the serenity of the reflections. Our first visit to the famous iceberg lagoon coincided with the setting of the midsummer sun in the northern sky over the Breithamerkurjokull glacier. This intense golden sunset provided the sidelight for the other Jokulsarlon sunset image in the gallery. The next day gave us close-up views of the icebergs, including this one containing an ice cave illuminated by sunlight transmitted through the ice. In 2015 I hope to shoot more often, print and exhibit more of my images, and blog more frequently! 1) Sometimes the iPhone gave the only useful image from a location — as at the base of the triple falls at Kirkjufell, where I was unable to keep the lens on my Nikon clear of water drops no matter how often I wiped it. 2) When I pulled out the phone at a location after being “done” with my camera I found compositions with the iPhone that I had missed. For me the moral of this story is to be more diligent about working locations! 3) Processing images on the iPhone using the apps that Tony introduced and demonstrated gave me a chance to play with effects that I might not try (or have tools for) in my Mac-based postprocessing environment. Using the iPhone to shoot and process helped me “get loose” and become more open to a variety of creative urges. The challenge for me is to bring some of this spontaneity and sense of play back to my DSLR shooting and processing. 4) The iPhone is a great tool to explore panorama compositions — either with the pano function of the Camera app or by stitching a series of separate images together using an app such as Autostitch — before going to the bother of setting up camera and tripod. Hoffelsjokul panorama; multiple exposures assembled with AutoStitch. Jokulsarlon panorama; iPhone camera pano. Since returning from Iceland I have struggled once again to remember that the phone is also a camera (old habits die hard! ), but I now know that even when the only camera I have is the iPhone I can still make images with impact. Pike Place Market (Seattle, WA); multiple effects using Snapseed. Finally I've been able to work through many of the images from our Iceland trip. This new gallery contains a baker's dozen of my favorites, with more to follow as I process them. This first set represents the "low-hanging fruit" -- images that were relatively straightforward to process and for which I had a clear vision of the final product. The ones I'm still working on need more thought, more effort, or both to achieve the end result I'm looking for. The image below is a bonus -- I could have included it in the gallery, but I needed something pretty for the blog! Challenge #1: Everything is new! This is, of course, a challenge whenever faced with photographing a new location, but Iceland is such an unusual place that the sense of novelty was enhanced. This is why making a first visit with knowledgeable local guides makes such a difference. Without Einar, Raggi and Tony to put us in good shooting locations we would have seen and done much less and missed some very cool things. Challenge #2: So much daylight! I knew we'd have very long days so close to the Arctic Circle and just after Midsummer, but the experience was quite disorienting. As you can see from the Weather Channel on my iPhone, we had 21 hours of daylight. During the first part of the workshop in particular we took advantage of the long days -- on one day we shot at 7 different locations over a period of 15 hours, ending up at two successive iconic waterfalls after midnight. This was one of those times when I wished I could get along with a lot less sleep. Challenge #3: Staying on task. This challenge was the product of the novelty of Iceland and the length of some of our days in the field. To jump out of the bus, grab the tripod, and take advantage of the photographic opportunities in front of me at location after location required a degree of concentration and focus (pun intended) that I had not anticipated. It was exhausting but also very rewarding. Challenge #4: Photographing extraordinary locations in ordinary (or even mediocre) light. It can't always be sunrise or sunset (even at Midsummer in Iceland!). How do you make the most of mid-day light or the gray and featureless skies that we encountered during the stormy second half of our workshop? For me, the answer was to think about shooting with a black-and-white image in mind. Almost half of the first 13 images in the gallery wound up being more satisfactory to me in black-and white. For example, I like the image below well enough, but I think the monochrome version in the gallery is much stronger. Working through the "raw material" that I shot on this trip to get the first set of finished images has given me a chance to savor the whole experience again. Definitely, I'm going back to Iceland! Lost in Iceland, Part 1: "So, what was it like?" It has been a bit more than two weeks since Carol and I returned from our photographic adventure in Iceland, and I am still processing -- not only the images, but also the experience itself. I have been asked the the "what was it like" question many times since returning, and I give two sorts of answers: a short one for those interested in my impressions of Iceland, and a longer one for those interested in the photography workshop experience. It is now a cliché to call Iceland a "land of ice and fire." Nevertheless, my experience of Iceland was dominated by both the glaciers and the evidence of volcanic activity. The landscape is stark and treeless (the urban landscaping in Reykjavik is the "largest forest in Iceland"), with fantastically shaped cliffs and mountains punctuated by lava flows, short and swift rivers of glacial meltwater, and countless waterfalls. Outside of Reykjavik Icelanders are sparsely distributed along the narrow southern coastal plain where houses and other buildings are dwarfed by looming cliffs. Iceland was settled by Vikings in the 9th century, and this population lived in near-isolation from the rest of the world for centuries. As a result, the Icelandic language is most directly related to Old Norse, the antecedent of modern Scandinavian languages. I was struck by how some Icelandic words seemed like they could be names of places or people in The Lord of the Rings -- not surprising given J. R. R. Tolkein's reliance on Norse and Old English sagas as inspiration for the trilogy. In the short time we were in Iceland I was captivated by its otherworldly beauty and the sense that the landscape is dynamic with change, as if it were alive. I will definitely be going back. Our workshop was organized by FocusOnNature's Einar Erlendsson. Einar's operation is first-class in every way -- it provides a professional infrastructure and the knowledge and insight of a native Icelandic photographer as a platform for workshops led by a variety of different professional photographers, mostly from the United States. The lead photographer was Tony Sweet, whom we knew from previous workshops. This was Tony's fourth workshop with FocusOnNature -- his blog post here provides a great summary of his perspective on the value provided by Einar's organization. One unique feature of this workshop was its timing: midsummer, with 21 hours of daylight and extended "golden hours" for photography, which made for some very long days in the field and photographs, such as the one at the top of this post, taken at or after midnight. As an added bonus, Einar arranged for the renowned Icelandic photographer Ragnar Th Sigurdsson ("Raggi") to be our local Icelandic expert and guide. Raggi, an outstanding nature photographer and a Photoshop wizard, not only made sure we found interesting and unusual locations but joined Tony in critique sessions and photo processing tutorials along the way. Flexibility and adaptability are the hallmarks of a FocusOnNature workshop, and Einar's ability to deliver these was put to a severe test by the difficult weather we encountered during the second part of our workshop. Despite rain and high wind Einar, Raggi and Siggi (the driver of the "Magic Bus") kept us shooting -- often changing meal and lodging plans at the last minute. Overall, it was an exhilarating -- and sometimes exhausting -- experience, with an singular and intense focus on photography. Thanks to Einar, Raggi and Tony we were able to see, do and photograph a tremendous number of things in a relatively short period of time, some of which persons traveling by themselves simply would not be able to do.